There are many gangs from the 1950s – which is my area of expertise – that are well-known not only to myself but to those that lived in the neighborhoods and just people in general. Gangs such as the Red Wings, Chaplains, Bishops, Mau Maus, Sportsmen, Viceroys and Dragons. However, there are probably just as many and probably more gangs that were around back then that are virtually unknown now. By the late 1950s – which I consider the heyday of youth gangs – there were between 100-150 bopping gangs across New York City. Some of them were the more infamous gangs that I have listed above. But many gangs were very small in numbers, had very small turfs of maybe only one or two streets and were only in existence for a brief amount of time, perhaps months instead of years like some of the big gangs. Because of the small numbers of some of these gangs, there are fewer people that are living now to tell their story. An example of a gang name that I have come across is one called the Seven Saints. The Seven Saints were a gang in Harlem and the information I have on them put the date around the summer and fall of 1947. They could have been in existence before and after that time, but I’m not 100% sure. I had never heard of the Seven Saints before this, so I’m not sure if the “Seven” was an indication of the amount of members in their gang or not. Angelo was sent to the Youth House for examination and on Boxing Day, 1946, while he was waiting in a clinic for examination, he escaped. 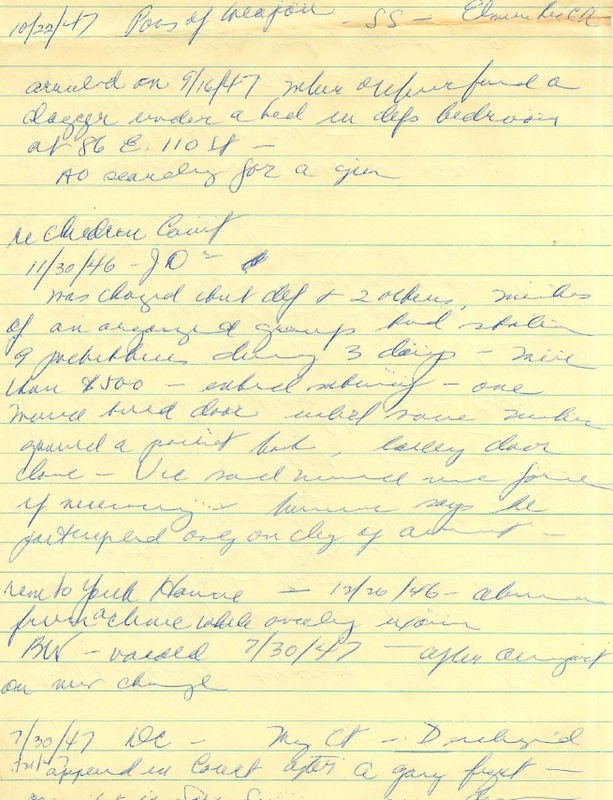 A bench warrant was issued for his arrest but he wasn’t captured until the spring of 1947, see point #2 below. 2.) 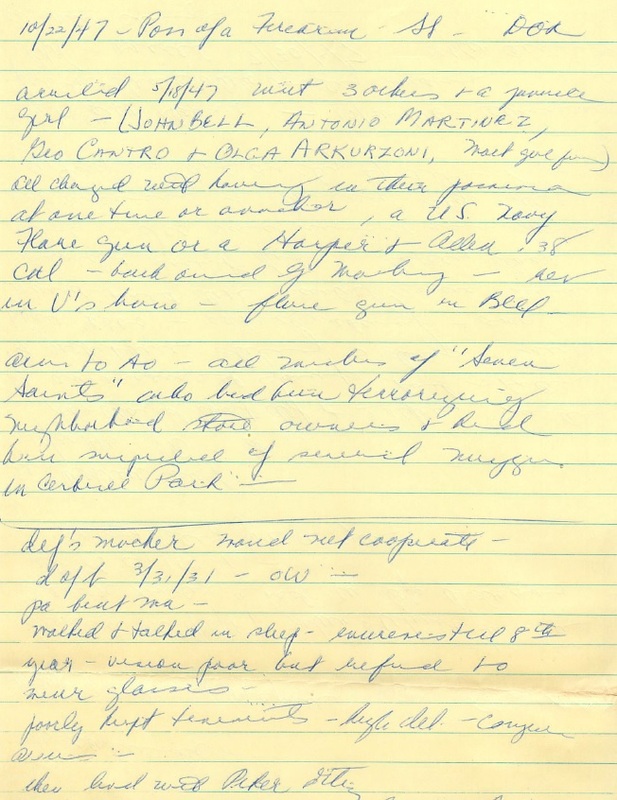 On May 18, 1947, Angelo, along with John Bell, Antonio Martinez, Geo Cantro and Olga Arkurzoni were arrested with a U.S. Navy flare gun in their possession as well as a Harper & Allen .38 revolver. It is here that the DA made a note for the first time that they were members of the Seven Saints. He also noted they had been terrorizing the neighborhood and had been responsible for muggings in nearby Central Park. 4.) On September 16, 1947, Angelo’s bedroom was searched by the police who found a dagger under his bed. So based on this timeline of events we know the Seven Saints gang from East Harlem existed at least in the spring, summer and fall of 1947, with a good possibility of being in existence in 1946 as well. By 1955, Angelo was no longer involved in youth gangs and had graduated to a life of dealing drugs and addicted to heroin, with numerous “tracks” on his arms from drug use. I don’t know the whereabouts of Angelo now, but if he was alive today (2013) he would be 82 years old. The Seven Saints are long-gone as well. Although I have heard of other Saints’ gangs in the City, this is the first I have heard of a Saints gang in Harlem. On a cursory glance I don’t see reference to the Seven Saints elsewhere on the Web or in books and this could be the only bit of paltry information we have on this gang. I realize that this page was a mixture of Angelo’s history and the history of the Seven Saints, but with all youth gang research the two are intricately intertwined.